OVERVIEW: Ever since Max’s parents were spirited away on a mysterious ship, he has longed to find them. He’s solved case after case for other people in his business as “solutioneer.” And he’s puzzled out the coded messages sent by his father. He doesn’t know exactly what’s happened, but he knows his parents are in danger—and it’s up to Max to save them. Max and his friends (and a few old foes) don disguises and set sail on a rescue mission. It will take all of Max’s cleverness and daring to outmaneuver the villains that lie in wait: power-hungry aristocrats, snake-handling assassins, and bombardier pastry chefs. And behind the scenes, a master solutioneer is pulling all the strings.... Has Max finally met his match? 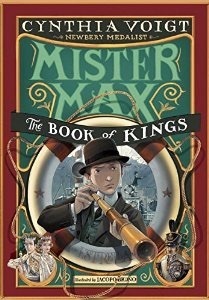 FORMAT: The Book of Kings is the third and final book in the Mister Max series. It is a children's mystery, historical fiction, adventure novel. It stands at 352 pages was published September 8, 2015 by Knopf Books for Young Readers. ANALYSIS: After two entire books of Max trying to uncover the mystery of why his parents disappeared, readers finally get the answers they were hoping for in The Book of Kings – the third and final chapter of the Mister Max series. The question is does it come to a satisfying conclusion? Answering that question is rather difficult for me. There are certain elements I enjoyed about the Mister Max series and there were certain things that fell flat. Unfortunately, the elements that I didn't care for seemed to outweigh the good parts. In this third installment, Max and his 'crew' head out Andesia which is a completely new setting with new characters. The problem I had was everything felt so rushed. The entire series revolved around the disappearance of Max's parents and they didn't even go to the place where the parents were to solve the mystery until a good quarter of the way through the final book. With the change of setting, there are a lot of things that are different. There is a new political system, new geographical setting, new customs, and new characters. This might have been great had the entire book been dedicated to Andesia or if some of this information had been present in previous books, but it wasn't. That left me with a feeling that too much time was being spent on this new setting and not enough time really exploring what readers had been waiting for – solving the mystery of where and why Max's parents disappeared. Another issue I had with The Book of Kings was the character development. Max seemed to grow and mature throughout the series, but the other characters did stuff that was completely out of character for them. For example, there was a romance angle that happened between Max's grandma and his painting instructor. It literally came out of nowhere. This might have been okay but space was at a premium in this book so starting a random and unnecessary romance just seemed a waste of valuable space. Pia, a favorite character, seemed to be MIA most of the book. Even her 'ending' seemed to be shoved into the novel as an afterthought. Another example is Max's parents. They felt extremely underdeveloped, not really thought out, and their entire attitude just seemed off. Their son risked a lot and did a lot to get them back and it seemed like the entire attitude was "oh well. Thanks I guess". I would have liked to see a bit more of a relationship between Max and his parents. The last issue I had was with suspending disbelief. Everything from the belief that this 12 year old boy could wander around and make a living on his own solving rather juvenile problems to the entire reason why Max's parents were kidnapped just was too much for me to take. I couldn't suspend my disbelief. I tried, but it didn't work. I couldn't get passed the idea that all these adults just shrugged their shoulders and were ok with everything Max did (quitting school, living on his own with a random roommate, starting a business). A disappointing aspect of the book was the lack of development revolving around Max's mysterious eyes. I also really hoped something would come of the whole "having weird color eyes". Every time Max was mentioned, people mentioned his eyes. I thought there would be some hidden meaning behind it but it didn't pan out. It was a bit disappointing. I was also disappointed in the reason why Max's parents disappeared. It didn't make a lot of sense and was rather confusing. It turned into this whole moral, human rights issue almost and helping the area switch political control. It just seemed as if it was put in there to send a message and less because it made sense with the plot or story line. Even with the issues, I do have to say that Cynthia Voigt's writing is absolutely beautiful. It really had a very nice flow to it and she is extremely talented. I feel if either the entire trip to Andesia had been left out or if she had devoted the whole book to it things would have turned out better. Is The Book of Kings a bad book? I don't think it is. I think there is a very specific reader who would love this series. I also think that younger readers may not be as critical of the book and would be able to enjoy it. I don't regret reading the series, but I do wish I had been able to walk away from the series feeling more closure and satisfaction than I did.